"After waiting for far too long to purchase a proper "grown-up" dresser (one that we'd actually want to keep for years to come), my partner and I discovered Martha. We waiting until she found the perfect mid-century dresser and then had her refinish it in a simple, classic white. I honestly couldn't rave more about how simple the whole process was, and how meticulous her restoration was. The piece is gorgeous, was delivered by an excellent team right to our bedroom and I have no doubt we will enjoy this piece for years to come. If you're looking for something unique and that elusive combo of vintage meets modern — look no further!" "Martha was patient in helping me search for a piece that met all my criteria… She was accommodating to look at different options and found a way to meet all my requests! The piece turned out beautifully‚ and she kindly sent touch-up paint for me with the delivery. I highly recommend Martha, and I hope to work with her again. You will love whatever you get from her." "My significant other and I are so pleased with our pieces. Martha and her team did beyond an excellent job. Martha is a complete pro! She walked us through the entire process of finding our pieces, sending us photos of their rehab, and setting us up with the shipper. Our furniture is absolutely gorgeous and we are so excited to own unique vintage work that's been updated with a great modern twist. we can't wait to work with her again." "Working with Martha was simple wonderful. every part of the experience — from sourcing the piece, to design ideas, and all the way through to finishing — was seamless. Martha really cares for her work and takes the time to get to understand what you're looking for. the dresser arrived and I couldn't be happier. A stunning piece of work, and a real reflection of an artisan who cares for her craft. thanks Martha!" "If you want something unique and amazing look no further. Everything went perfectly and the furniture is even more beautiful in person than pictured! (: Martha answered all my questions and addressed my concerns and was just a pleasure to work with. Will definitely be looking to her for my next furniture purchase!" "I've purchased four items from Martha...All four turned out beautifully and they are all wonderfully unique. Every time people see the pieces they always want to know where we got them! Martha is great with communication, very prompt with response, and listens to what you want. I've been so pleased with everything she's done and would buy from her again in a heartbeat! The quality of her work is also incredibly high - I've never gotten something and felt like I overpaid or that it wasn't what I was expecting. Way better than buying just another dresser from PB or West Elm that everyone has and isn't made half as well. :) Don't miss out - you won't regret it!" "Working with Martha was wonderful — she created a stunning piece for us to use as a changing table for our son's nursery, and we absolutely love it! Martha made the piece so beautifully versatile that we plan to use it elsewhere in the house once it's no longer needed in the nursery! She does lovely work, she's very talented, but she also listens to what her clients want and interprets those wants into amazing treasures!" "I have been admiring Martha's work for some time and was waiting for the perfect project to work with her! For our nursery we want a pop of color and chose to make the dresser a soft but bright green to fit our theme. Martha was quick and efficient to work with and the dresser is the perfect pop!" "Martha created the most beautiful pieces for us. We will cherish them. Her style and use of colors are exceptional. Her professionalism is flawless - from our exchange as we created a vision for what we wanted, to modifications along the way, to the execution and delivery. It was all seamless. She is one of the best artists (and distributors) I have had the pleasure of knowing via Etsy." "Martha was a delight to work with start to finish, and I absolutely love the final product. she has high standards, and so when she wasn't pleased with the outcome of one of her stain tests, she offered to source a different tallboy dresser. I love this one even more than the one I initially selected. She was excellent communicating throughout the process and provided guidance when I didn't have strong preferences. I highly recommend her. If you want a piece that will make you smile each time you see it — one that you'll want to pass down to your kids — just call Martha." 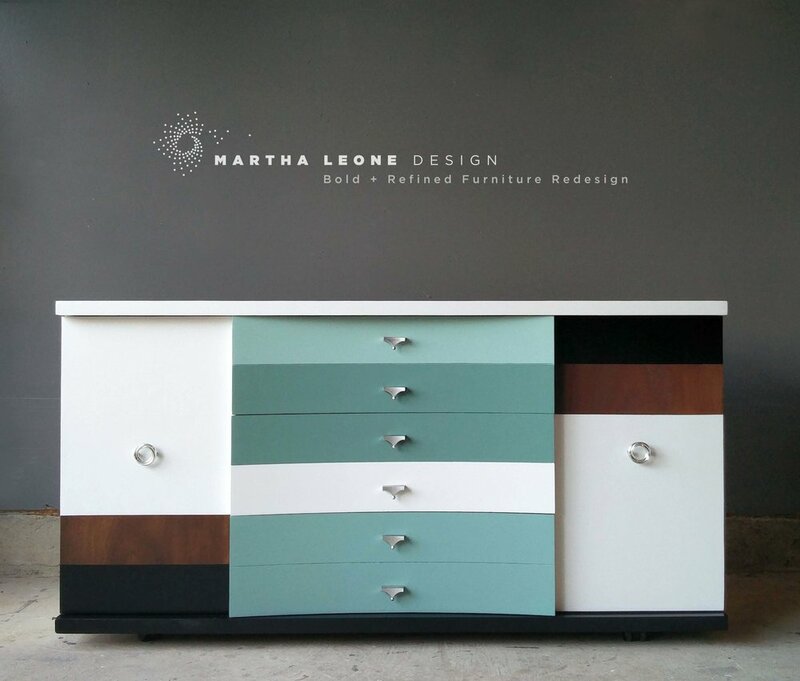 "We recently purchased a recovered credenza from Martha, and it exceeded our expectations. The obvious care she takes in finding and bringing back to life beautiful pieces while maintaining the highest degree of professionalism and communication made this a perfect experience. From the moment we saw it on her website to the moment we saw it in our dining room, we are very happy customers!" "Working with Martha was an absolute delight. She searched tirelessly for the perfect piece that fit our dimension limitations and then, within two weeks, created a piece that exceeded our expectations. She took the time to chat with us on the phone to get a true sense of our vision and presented us with multiple options to choose from. We could not be happier! Do yourself and your home a favor and reach out to Martha." "Martha created a custom server for us. Not only is the finished product stunning, but Martha is a pleasure to work with -- from picking out the paint color to troubleshooting some carpentry issues -- she made sure that we were completely satisfied. She is a true artist, and I hope that we have the opportunity to purchase from her again." During the painful, lengthy process of downsizing from a modern historic home to a spacious one-bedroom apartment, searching for "the right" credenza for my dining room, l discovered Martha's website. Among the obvious retail offerings, l found nothing that would work, and what l did find was either cheap (not necessarily in price) or beyond my budget… l was drawn in by her impressive portfolio and the notion of reincarnating older pieces, far better constructed than most furniture on the market today. She immediately "got" what l was looking for. Martha is extremely talented, grounded in her craft and passionate about what she does… Everyone who visits exclaimed about it. For others who may be downsizing, you may find helpful, as l did, the counsel of William Morris (1934-96, English architect and furniture/textile designer of the Arts and Crafts Movement): “Have nothing in your house that you do not know to be useful, or believe to be beautiful.” Martha will help you get there, bringing in the beauty.